Firmly committed to creating jobs and growing local businesses in the communities in which it operates, BP seeks to recruit its workforce from the community or country in which it is based. Additionally, when certain skills are in short supply, BP offers training programmes and on-the-job development. This case study is based on the 2017 Sustainability Report by BP published on the Global Reporting Initiative Sustainability Disclosure Database that can be found at this link. Through all case studies we aim to demonstrate what CSR/ ESG/ sustainability reporting done responsibly means. Essentially, it means: a) identifying a company’s most important impacts on the environment, economy and society, and b) measuring, managing and changing. In its 2017 Sustainability Report BP identified a range of material issues, such as climate change and the energy transition, safety, human rights, governance and risk, people and ethics. Among these, supporting local workers and suppliers stands out as a key material issue for BP. To identify and prioritise material topics BP met with almost 100 different organisations which included investors, NGOs and business partners, and organised sessions with its employees. What actions were taken by BP to support local workers and suppliers? In Georgia, BP has been implementing technical development programmes for local workers for several years, supporting a government priority to address skill shortages. In 2017, BP partnered with the Georgian Technical University to establish a training centre for high voltage electrical engineering, industrial automation, mechanical engineering and other technical areas. The first group of over 70 students, started in November 2017. In Azerbaijan, BP’s enterprise development programme helps local companies build their skills so that they can meet international standards and improve their competitiveness in the market. Since its beginning more than a decade ago, the programme helped local businesses secure contracts with BP worth more than $530 million. In the US, BP partners with organisations like the National Minority Supplier Development Council, to provide mentoring and training programmes for businesses that will help them develop their skills and become more competitive when bidding for BP’s contracts. 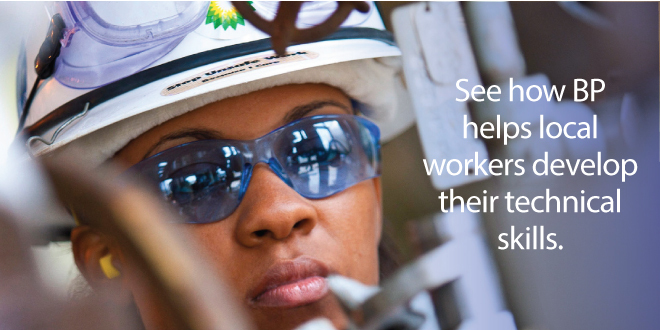 In 2017, BP spent $478 million with over 200 minority and women’s business enterprises. In 2017, in Oman, BP started producing gas to cover approximately 40% of the country’s daily gas needs. In addition to helping meet Oman’s growing energy needs, BP implements a multi-year training programme that helps Omani nationals develop their technical skills. The programme begins with participants learning skills such as mechanical and electrical engineering, before completing assignments in BP’s oil and gas fields to gain practical, hands-on experience. Up to now, over 70 Omanis have graduated and are working for BP. Disclosure 413-1 Operations with local community engagement, impact assessments, and development programs does not correspond to any SDG. Note to BP: With each case study we send out an email requesting a comment on this case study. If you have not received such an email please contact us.